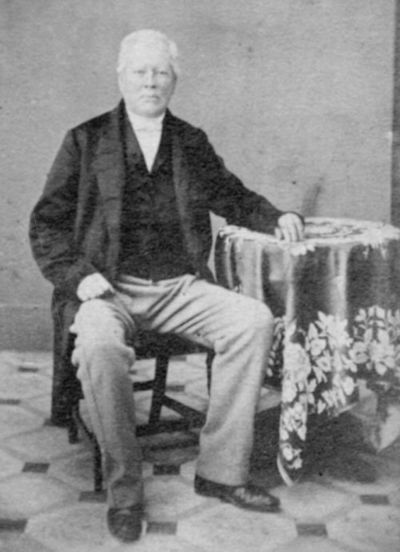 John Morgan was born about 1797, the son of William Morgan of Thornbury. William was described as a farmer when John married in 1840 and an innkeeper when he married in 1861. John himself was a tailor for most of his life. Later when he married in 1861 he was described as a bailiff and in the Census of 1861 as a house agent. John Morgan married Elizabeth Jenkins on 21 November 1822 at Thornbury in South Gloucestershire. Elizabeth was born on 12 March 1795, the daughter of John and Sarah Jenkins of Sibland. John and Elizabeth had several children: Sarah Virgo Morgan baptised on 22nd June 1823, Thomas, baptised on 7th August 1825, Amelia baptised on 28th October 1827, William baptised on 14th January 1829, Charles baptised on 2nd October 1831 and Elizabeth Jenkins Morgan baptised on 11th May 1834. Elizabeth Morgan died on April 20 1834 aged 39 years. Their daughter, Elizabeth Jenkins Morgan, died on the same day aged four. On 30 September 1840 John married for the second time, this time to Elizabeth Cook, daughter of Thomas Cook, of Thornbury, a labourer. In the 1841 Census, John was a tailor, living in the High Street with Elizabeth and his two sons, Thomas, a tailor’s apprentice aged 15, and Charles aged 9. John’s second wife Eizabeth died 16 July 1842 aged 34 years. In the 1851 Census, John was a master tailor living in what we believe to be 44 Castle Street with his daughter, Amelia, aged 23. Amelia was described as ‘At Home’ and Charles ‘… out of place’. On 26 February 1861 John married for the third time, this time to Elizabeth Mallett, the daughter of Christopher Dimory, a farmer. Elizabeth was also a widow and her husband had been Henry Mallett. Elizabeth and Henry Mallett previously had lived on a farm at Hogsdown near Alkington. By the 1861 Census, John and Elizabeth were living in 9 St John Street. John was described as a house agent aged 62 born in Thornbury. His wife was Elizabeth, aged 55 and from Berkeley. It is interesting to note that John married three times, each time to a lady called Elizabeth. The photo on the right was taken of John in 1862. John died on 6 December 1865 aged 67 years. Charles Morgan – on September 17th 1863 John Morgan’s son, Charles Morgan married Georgiana Payne in Westbury on Trym in Bristol. Their marriage was announced in the Bristol Mercury. Georgiana was born about 1827 in Bayford in Hertfordshire. In the 1851 Census she had been in service as a cook in Highnam in Gloucestershire. We do not know how long Charles Morgan had been operating his omnibus service in Thornbury but in an account of a great storm in May 1863 in the Bristol Mercury it was said that a fallen tree had caused Morgan’s bus to make a detour. The 1867 Rate Book shows that Charles Morgan was living at Clematis Cottage (now 15 Castle Street). The 1861 Census had described Charles Morgan as a “visitor” in this house, which was tenanted by William Powell. There is most likely a family connection between the Morgan family and the Powells, but we have not yet been able to trace it. The 1871 Census shows that Charles was living with his wife, Georgiana and their three children: Elizabeth aged six years, Ann aged three and Sarah aged only one. Charles’s stepmother, Elizabeth Morgan aged 65, was described as a visitor of her stepson at the time of the Census, although she may have been actually living there. Charles Morgan was said to be a cab proprietor. Charles died in 1878 aged 46 years. The Bristol Mercury of 24th August 1878 advertised the sale of goods that might be of interest to “Bus and Cab Proprietors and others” all of which belonged to the estate of C Morgan deceased. The goods included four horses, a two horse omnibus designed to carry 16 or 18 persons, a break which was designed to carry 12 or 13 people and a third vehicle to carry 14 or 15 people. There was also a great deal of harness, chafe machinery and corn bins and a wide range of household effects. The 1881 and 1891 Censuses show Charles’ stepmother, Elizabeth, moved in with George Paradise Mallett, her son from her first marriage, in his home in Gloucester Road. She died on 28 January 1893 aged 87 years and is buried in Berkeley. The family seems to have been dispersed. The 1881 Census shows that Ann and Sarah, the two youngest girls went to live with their uncle William Morgan, who had been born in Thornbury but was then living in Cardiff. Elizabeth the eldest girl seems to have been sent to work for relations. She was working as a companion to Bryant Burchell and his sister, Jane Burchell, in St Mary Street. Bryant and Jane Burchell seem to be related to Charles Morgan through the marriage of Bryant’s brother Alfred Burchell to Ann Morgan. By 1891 Elizabeth and Sarah were living with another relation, Annie Matthews and her husband William in Cardiff. The 1891 Census also gives us an indication of the fate of Georgiana Morgan. The Census shows us that she was in Wotton St Mary in Gloucester. Sadly the entry says she was a lunatic. This term can mean many things and covers a great many physical infirmities such a a stroke or mental problems such a depression and so we cannot comment on her condition. She was still in the asylum aged 74 in the 1901 Census. We believe that she died there aged 82. She was buried in the churchyard of St Mary’s Church in Thornbury on February 26th 1909. Of John’s other children, we know that his daughter Sarah Virgo Morgan migrated to settle in Adelaide, Australia, probably already having married Robert Williams, son of Mehitabel and Mark Williams. Robert died quite young in 1863, aged 43, but Sarah lived to 1910.